Ball's article is an excerpt from his book Beyond Weird which is problematic but it's the least problematic book among the 10 or so "books on interpretations of quantum mechanics" that I detected and mentioned in the recent 5 years or so. 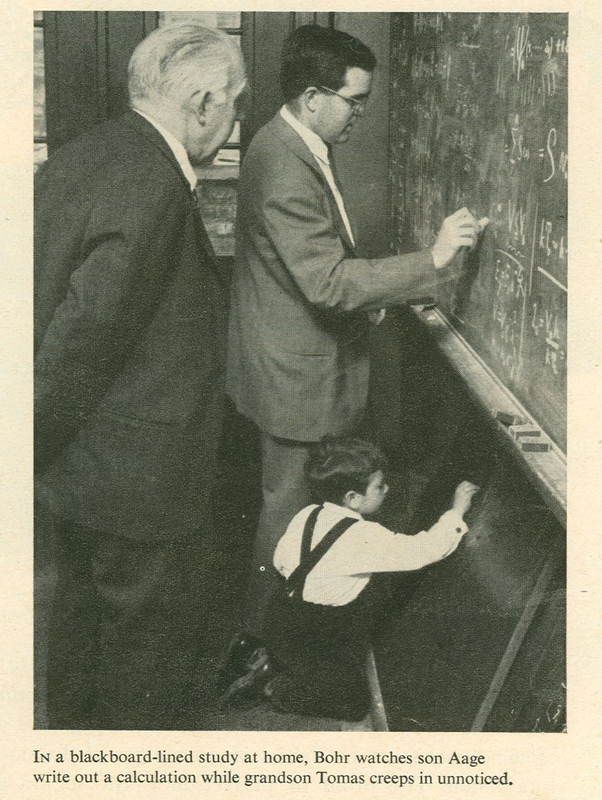 On this photograph, you may see the real Bohr (Niels, left) along with son (Aage, center) and grandson (Tomas, bottom). If you asked why the baby was writing Navier-Stokes equations on that blackboard, it's because the baby was going to become a fluid mechanic. And now, Tomas Bohr – along with George W. Bush's twin brother John Bush and others – discussed a weird paradigm that was hyped in recent years, namely that "oil droplets jump just like quantum mechanics". OK, genetics works and the grandson of Niels Bohr is very unlikely to be a complete idiot. So of course, these folks found out that oil droplets aren't like quantum mechanics. This map is completely spurious because classical oil droplets have no observer dependence, no randomness, no uncertainty principle... On top of that, droplets and quantum mechanics are different even mathematically because the equations for droplets – classical observables – are virtually guaranteed to be nonlinear in the real world while the equations for state vectors or density matrices must be perfectly linear in quantum mechanics due to consistency. I think that it doesn't really matter what they exactly did and how they argued. It's clear that if you look carefully, you may easily find fundamental – and very specific – differences between the behavior of oil droplets on one side; and quantum mechanical wave functions etc. on the other side. And these folks found some differences. And Wolchover wrote an article about these matters. Now, Ball has written a text about some conceptual and basically insurmountable problems of the "many-world interpretation" paradigm sometimes used to misinterpret quantum mechanics. Among other things, he focused on the impossibility to define what a "splitting of the Universes" is and when and how many times it takes place. This is of course one of the problems about MWI that I see and often write about – but there are others, too. The articles are obviously imperfect from my viewpoint – or, almost equivalently, unequivalent to my writings about these issues – but they are far more reasonable than almost all texts that the science journalists wrote about the foundations of quantum mechanics in recent years if not decades. So far so good. However, the comment sections are frustrating. Both articles have attracted over 100 comments by now. Pretty much all the most upvoted comments attack Wolchover's and Ball's texts. You can see that none of these people actually understands quantum mechanics and all of them assume that classical physics is right throughout their comments and lives. But they have been trained by dozens of bullšit popular anti-quantum articles that were published in recent years and decades – and they became versions of the NPCs, non-player characters. If you criticize many worlds etc., you are a heretic and the criticism is as indefensible as Aristotle's criticism of the atomic theory because all the problems of the atomic theory – and the "interpretations" of quantum mechanics – must surely be solvable and they will be solved. And those comments include tons of such rhetorical pieces without any relevant content that only shows one thing: all these people have been brainwashed to spit on quantum mechanics and worship all the misinterpretations of quantum mechanics. A lot of harm has been done – in certain environments, a sensible discussion about these matters has really become impossible. I think that these anti-quantum zealots must feel offended that someone dares to say that the "alternatives" to quantum mechanics as defined in Copenhagen don't work. They may start to write petitions to fire all the people who dare to say that quantum mechanics works and the alternatives don't. Bohr, Heisenberg etc. have been white, male, and straight, and cissexual so the defense of quantum mechanics is surely racist, sexist, homophobic, and transphobic. I write about such things on my blog where I can easily ban people who are anti-quantum zealots – even if they avoid vulgarisms and other "objective" violations of policies. But I think that if someone writes sensible articles about the foundations of quantum mechanics on servers where it's expected that dumb but polite comments are approved, he or she is a masochist.